More projects by founder, Jake Lee-High, win awards! 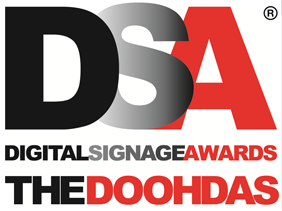 This time the DOOHDAS International Digital Signage Award. Future Colossal Founder, Jake Lee-High's creative and technical direction while working for a previous company lead to this prestigious award. To learn more about the DOOHDAS award take a look at this article. Multiplayer Touch Surface Video Game "Bump"
Take a look at this sneak peak into our new multi-player, touch surface video game titled "Bump". Designed for the Grasshopper Game Lounge, "Bump" is an action packed, competitive, 6 player game that keeps people on edge. In order to win, players work together using projectiles and physics simulations to push objects into the opposite team's goals. It's a blast to play on the table and now has us thinking about other forms of game play... such as large, multi-player games using peoples full bodies as controllers. Take a look at the of Google Sandbox coverage of BMW: A Window into the Future.